The other day I was driving up the road and saw a gentleman pushing a shopping trolley. This is quite a common occurrence where I work as we have a second hand scrap metal dealer close to our office. The trolley pushers collect scrap metal and other recyclables from around the area and take it to the dealer for some money. This is the only income they earn and in my mind at least they are doing something to earn a wage. But, the surprise in the trolley was not the scrap metal, but the children in the trolley. My first thought was “oh sweet’, and then I realized that the children were being pushed around because the probably had no where else to be. They were not in school, being looked after in a safe environment, and probably their parents’ are homeless. We have a new neighbourhood watch in our area and they have taken to confiscating these trolleys. Basically they are taking away the persons only means of earning a livelihood, and in the case of the person I saw, his only means of keeping his children with him, and safe, while he works. I find this victimisation so unnecessary and wish those people doing the confiscating would think of proactive ways to give these people a hand up, rather than kick them down! We have one gentleman who collects our scrap metal once a week. He saves us the hassle of getting rid of it, and he earns himself money for food – a basic most people take for granted. My lavender surprise cake was just that, a surprise. I had no idea what to expect when I cut it open and I was so impressed with how it worked out! 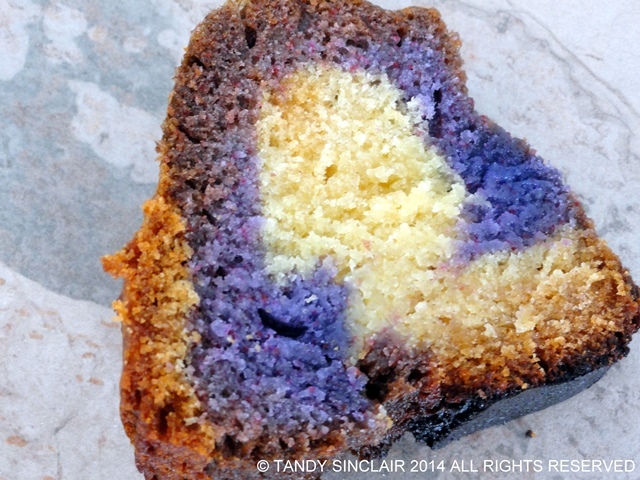 You don’t have to use purple food colouring like I did, I just wanted something to match my blog. I am sure if you try this with any colour combination it will work out just as well, and you too will be surprised. Blog-checking lines: For the July Daring Baker’s Challenge, Ruth from The Crafts of Mommyhood challenged us to bake a cake. But not just any cake; she asked us to add in a special surprise for our eyes as well as our taste buds! Such a pretty cake, and I imagine very tasty. I’ve never seen lavender vinegar. Do you make that? I love the idea of using lavender in a sweet recipe. It is horrid what people who are more fortunate do to others that are less so! How beautiful! So glad the “surprise” worked out in the end! I also wish people would work together to help one another and look a little deeper instead of just doing what society deems acceptable. Thanks for the compliment Melanie – you are welcome any time to pop in for a test of the weeks baking. It is the local SW brigade that are taking away these trolleys – so sad! The scene you saw is both beautiful and sad. How lovely of the father to have his children with him, safe and sound, although the circumstances are clearly less than ideal. Looks at those colours! This calls for a bite!!! Too often people want to sweep away the less fortunate so they don’t have to look at them and feel any responsibility to help. Some people have a very rough time keeping food on the table and it’s not because of laziness or lack of effort. They just weren’t born in the right spot. This cake is really beautiful. I can only imagine the taste! Great looking middle to the cake and lavender is in season right now so this sounds perfect. Tandy, the wonderful way you told your story today is a perfect meta-telling of it all: the expected (or at least hoped-for) outcome of creating a recipe with what should be for diners an charmingly, disarmingly UNexpected outcome when they cut into, then bite into the cake…contrasted with this, the intent to “clean up the neighborhood” apparent in confiscating the trolleys having the UNintended consequence of depriving the homeless of not only the means of making their paltry portion of a living but also of childcare means, possibly of home itself, and most ironically of all, of the tool and motivation to clean up the neighborhood by removing recyclables that would otherwise be waste or trash. That’s a lot to pack into one post! Well done. I think it’s a little extreme to confiscate the collectors’ carts. We have people here in New York that push carts around, raiding bins for empty bottles and cans so they can collect the tax deposit (5-10 cents per item). It’s only really an issue when they occasionally don’t put the lid of the bin back on (rain/rats/ and other awful things can get in) or they throw the things they don’t want on the ground. Otherwise, I don’t see that they’re doing any harm. Everybody needs a source of income. I agree that the folks out in your neighborhood shouldn’t just be kicked down like that. The first time I became aware of the plight of the homeless was in 1988 when I was in New York – living in a wealthy borough and having people sleeping rough made it all very real to me! Hi Tandy, well said about giving others a hand up and not down!!!! Now for your lovely cake, my lavender bush is growing like mad. Would love to make this. It’s just the purple part I use right? This cake is beautiful, stunning visual appeal! It’s funny that we live in such different parts of the part, and even here, people drive around on garage day to pick up scrap metal to make a profit, and they do well at this! We have a scrapyard around the corner and sometimes scrap our own. Thank you for sharing this story, it’s so easy to forget that not everyone is so fortunate as we are. Cake looks amazing! I love that this cake matches your blog. Such a fun surprise! Now that indeed was a lovely surprise inside. 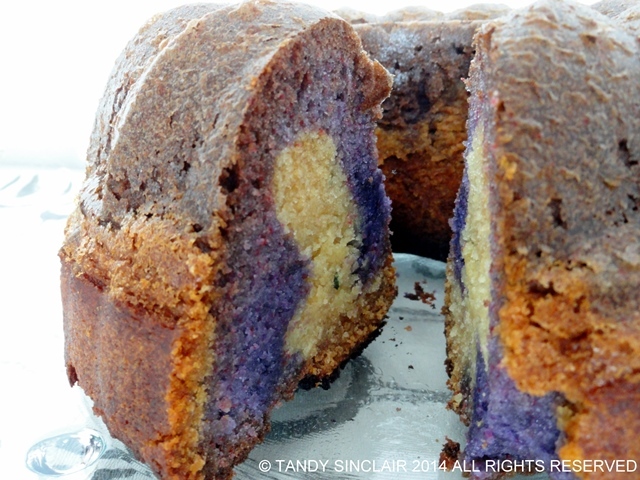 I love bundt cakes and I’m sure your lavender cake must have been as good as it looks. So sad, if only the whole world had the same attitude as you, if we all helped, there would be no poverty or hunger. That would be an ideal world! I think some people just try and see the bad in others! Breaks your heart for the children and the parent or parents who must try to provide for them. Thanks for sharing this story and reminding us to help others as often as we can. Am so glad you too are concerned. I love surprises! This is a neat idea. Love the pretty purple colour!